And the waiting continues...................... - AcrossPG Exams! As you probably have guessed, its about the NEET case. 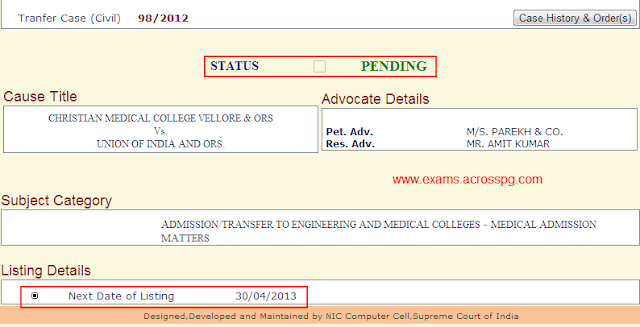 On 23rd April seeing the attitude of CJI towards the NEET it looked like the case is going to end soon. Hon'ble CJI directed the MCI council to conclude their arguments on 25th April (next date of hearing) and case was marked for final disposal. He even rejected the request of other lawyers to present their arguments in the court and directed them to submit written arguments. A hope rose among the 90000 doctors that finally the verdict and results will be out by 1st week of May and finally they will be able to carry on. It was also a relief because summer vacation of supreme court is about to start and secondly CJI Hon'ble Kabir is going to retire in July 2013 which would make the conditions worse as the new CJI will again have to study the case from the beginning which would take another few weeks, that means still long wait for doctors. But unfortunately on 25th April the SC gave another date ie 30th April, and so the case will continue and there is again no updates from the SC about when the verdict will be given and when the results will be declared.